Sydney Shop Girl: The Jamie Cookbook Remains Elusive. I Am Forced To Improvise and Conclude With A Cryptic Message. The Jamie Cookbook Remains Elusive. I Am Forced To Improvise and Conclude With A Cryptic Message. Well, I was still on my mission to find Jamie's 30 Minute Meals today. I know there are rumours that perhaps 3 course meals cannot be served in half an hour without the assistance of a production crew (thanks for the warning, Brasilian_Babe) but once I put my mind to finding a cookbook, I find that cookbook. It was not to be. I returned from Chatswood Chase this afternoon without a copy of the book. It appears to have sold out everywhere. I can't say that I came home completely empty handed. This photo is a bit of a hint. Yes, I got a Birkin. I found myself a new pair of glasses. I realized that I hadn't made a claim for a pair for a couple of years so decided it was time to actually use my health insurance. Unfortunately, because of facial structure, I just can't do plastic spectacle frames (bye bye Pucci frames). They fall down the bridge of my nose. I also can't do rimless because I'm so short sighted in both my eyes the lenses wouldn't fit that kind of frame nicely (bye, bye T&Co black rimless with the Paloma cross on each arm). We finally found a pair for me. It's going to take a couple of weeks to sort them out but I will show them to you when I get them. They are very work appropriate and say "I am imploring you to take me seriously and respect my authority. Or else the House of Gucci will not be amused." Hope it works. Actually, Hilary's Birkin is relevant to my day. Mr SSG and I have been planning our holiday again. It's still in May and it's still going to be in the US. Except, we've decided Honolulu may be the go. Our last hurrah. Hawaii is apparently the place for Hermes shopping, due to its high turnover of tourists. The stores are restocked several times a day, so the rumour goes. Also, we will be in the outlet area. I remember The Stylish Shoe Girl reporting favourably on this. TSSG - should I stay at the pink hotel too? Did you love The Royal Hawaiian (it's official name)? Do any other readers wish to advise? I am being resourceful in the absence of Jamie's book. By resorting to old standby dishes that take half an hour to prepare. Unfortunately, only a single course. Unless you count washing grapes as the dessert course. Firstly, the Malaysian curry with chicken and potatoes. 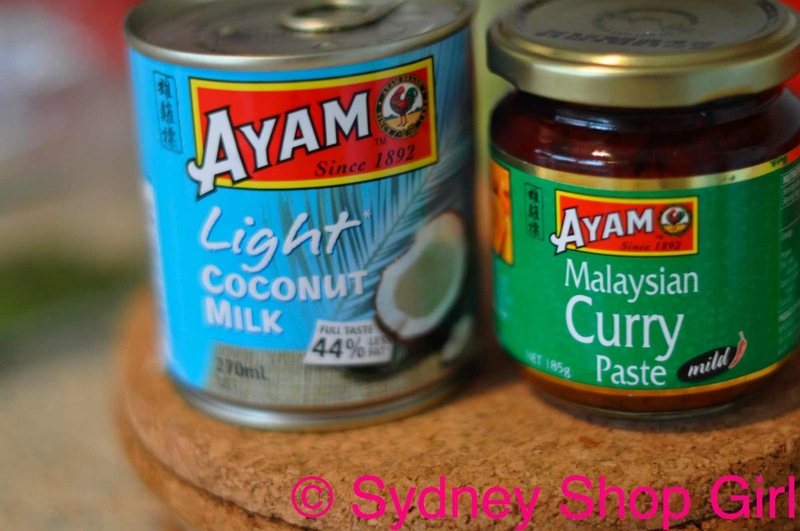 Time saving shortcut #1 - store bought curry paste. Ayam is the Masterfoods of Chinese cooking. I trust it with my life. 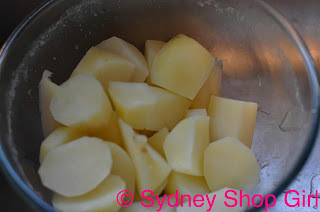 Shortcut #2 - microwaving the potatoes before adding to the curry. 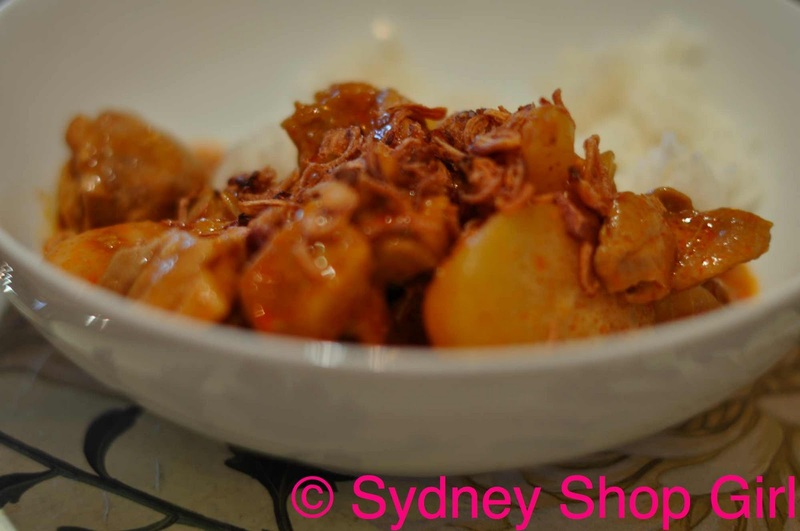 A good chicken curry has to have potatoes! The garnish of choice? Fried shallots. 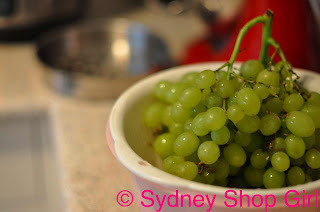 We really did just have washed grapes for dessert. Well, I hope you've all had a restful weekend or an enjoyable one or both, even. Here's to a good week all round that will only give us what we can handle and allow us to accept that whatever happens, happens. I was going to say the book depository too!! Curry looks GREAT, nuking the spuds is a brilliant idea. I'm going to do this next time, I'd never thought of it before! 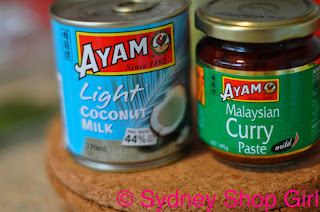 I just love Ayam coconut milk but especially the cream and can't bear the pantry stock to run low. Many years now since I visited Hawaii. Are you planning to island hop SSG. Maui is beautiful. Thats where I got mine - the book depository. It's the only place I buy books from... so cheap! Mmmm - I hope your week goes as it is meant to. Do you aspire to a Birkin? I do love your Bayswater. SSG - The Pink Palace is great! Fantastic location (right by the shops...err...beach). If you don't stay there then you at least have to attend their luau, which is one of the best. The Sheraton on Waikiki is right next door and is also a great hotel, if you wanted to stay somewhere less expensive. Oh and the shopping is amazing! Hope you will find your Jamie cookbook soon. I bought recently 2 books by Leon, I adore especially "Leon Book 2: Naturally Fast Food". Surprised our visiting son and his fiancée with some dishes - they were absolutely delighted - as was I.
Oh a Hermes Birkin would be an exciting purchase...new glasses are a quick way to perk things up though! Your holiday plans do sound like fun...good luck getting your hands on the Jamie cookbook. I see that FF tagged you today! Love the new glasses! I'd heard good things of your blog so have popped in to follow. Thanks everyone for the suggestions on where to buy Jamie's book. I will check out The Book Depositary. Anonymous: thanks for the hotel and location review! Sounds great. Britta: sounds like a great book. Afraid I was being cheeky. No Birkin for me. Not for many, many years I think. Hostess: hello and yes I need to respond to my tag. Caz: thank so much for stopping by! Will pop over to your blog as soon as I can. SSG, I am concerned about your holiday! Is Mr. SSG a very keen dedicated shopper? I have never been to Hawaii so can offer no suggestions here - but what else is there to do in Hawaii besides shopping? I've stayed at the Royal Hawaiian, and at the Halekulani. I preferred the Halekulani, but the tower of the Royal Hawaiian might be OK. The old part of the hotel doesn't really take advantage of the beach location. I did like the way the Sheraton looked, from the outside, but didn't ever wander inside. I love Oahu, and be sure to take a surfing lesson if you never have. The guys are great and the waves perfect. Despite all the build up, all the high rises, you can still feel the true Hawaii underneath. Be sure to drive over to the North Shore too. wait wait wait...you got a Birkin? I love the dessert, very like what I have in my house (but I am not a cake person so it's fine with me). Hahaha, everyone thought you got a Birkin and not specs, naww. I will be excited at my first Hermes anything purchase in the future, nevermind a Birkin for me. I will laugh if I find Jamie's book up here. Which is likely because we always have tonnes of those designer for Target ranges on sale (and in small sizes) and what not. I also have the same woe-ful problem with certain glasses like yourself - but I do have faux Wayfarers as sunglasses and they are terrible in humid weather. Ah well. Keep the Hawaii dream! Am excited for you! Hello, I'm just stopping by after seeing you mentioned on FF's blog. I've also been looking for the jamie oliver book (in Perth) and like you, have been having no luck. I think the publicity about the meals taking longer than 30 min (duh..) has made the book popular again. I'll be trying your readers suggestions to get my mitts on one. I'm off to read through your archives now - what a great blog I can't believe I haven't found it before. I stayed at the Sheraton last year and it was AMAZING. Really nice pools, big resort feel. Even if you don't stay there I recommend going up to the restaurant/bar on the top floor. The view is gorgeous and I think the cocktails and food were good too. One thing you should do is rent a car/ scooter and drive around the island, up to the northern beaches. There are all these shrimp farms on the way, selling freshly cooked coconut shrimp. I loved the food in Hawaii, so fresh and delicious. Handfootwoman: that is a great idea. If I can drive in Sydney, I will definitely be able to drive in Hawaii? Here's hoping. Cybill: thanks for stopping by! Lanelle Elizabeth: I think it's a sign. All my readers are subliminally imploring me to go forth and drop the cash on a Birkin. Will have to tell the CBA I did it for the blog. This isn't all that relevant since you've already ordered your glasses, but my friend had nose pads drilled into plastic frames. Sorry a bit delayed in keeping up with blogs at the moment. The Royal Hawaiian is the only way to go. If you stay there, for the old world charm value, you really need to request a room in the original tower. The only other hotel worth a look on the Waikiki beachfront in my opinion is the Halekulani - almost next door. We almost stayed there. Some friends of ours stay there recently, but they preferred The Royal. Have another look at my photos, I am sure it will seal the deal!!! I bought Jamie's book about 6 months ago (obviously easier to get in the UK. I've found that I can make a dinner in about 35 mins. Not bad considering I'm a hopeless cook, although to be honest I often leave out the pudding/sweet part of the meal. Hope you've found the book by now, there are some great recipes in it.